The influx of slaves into North America during the colonial and post-colonial years demonstrates the broad-reaching results these migrations can have on population health and disease ecology. Population health is the study of health as a phenomenon of an aggregate of people. Even though it does have some very personal or individual forms of statistics that are measured, the overall outcomes of these measures are interpreted as a result of group behaviors. The assumption being made is that there are certain “missed” and erroneous statistics that are compensated for when we look at large enough numbers to constitute a sizeable population. Large numbers of people undergoing an evaluation produce better results than exceptionally small numbers. In terms of the history of slavery, the approach to understanding African influences upon medicine could focus on the more unusual cases of Africans making their way to the New World. We normally see this published as that story of the famous African chemist/alchemist who came to North America by way of a ship landing down in what was officially considered New Spain. That occasional African, or more precisely stated, Egyptian descendent of the Old World may have been fortunate enough to achieve economic success due to personal family links to a famous Jewish family or his/her relationships to an important western European leader. When it comes to the history of individual slaves and slavery, we have two parts of this history that are worth exploring when it comes to understanding and proving any influences African culture had on early United States medicine (and to some extent pre-United States, colonial medicine). 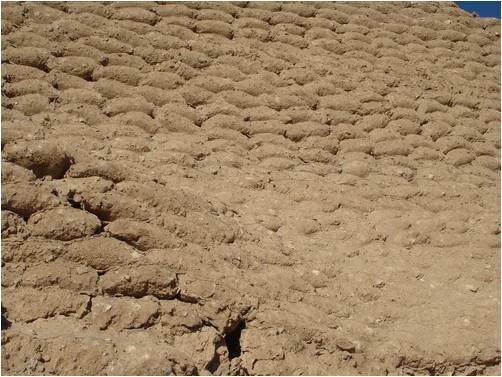 Disease ecology is the study of disease behaviors topographically, environmentally, ecologically, and to purists more interested in the geographic profession, spatially and temporally. Disease ecology is the most important part of the history of African influences upon mostly United States medicine. Whereas diseases generated in India, the Orient and Eastern Europe had their most important and earliest influences upon western cultures and medicine in Europe, it was the medicines and cultures of Africa, by way of South and Middle America, which had some of the most important and often most unrecognized influences upon United States medicine. United States culture enabled the events needed for African diseases to become a part of the local Darwinian biological ecology of the United States, as well as the neo-Darwinian sociological ecology of this country. United States culture also facilitated the manumission related freedom needed by members of African culture in order for some of their first contributions to be seen in the American medical professional jounrals. Unfortunately, the negative side of this history of African people upon United States medicine also consists of those opposing, immoral stories about the influences of racism and ethnocentricity upon medicine in relation to Western European beliefs about the health and diseases of African people. The use of slaves as not only physical servants struggling to meet their “Master’s” personal and professional needs, but also as the means for exploration in order to validate new disease-related claims or treatments, like the efficacy of inoculations ca. 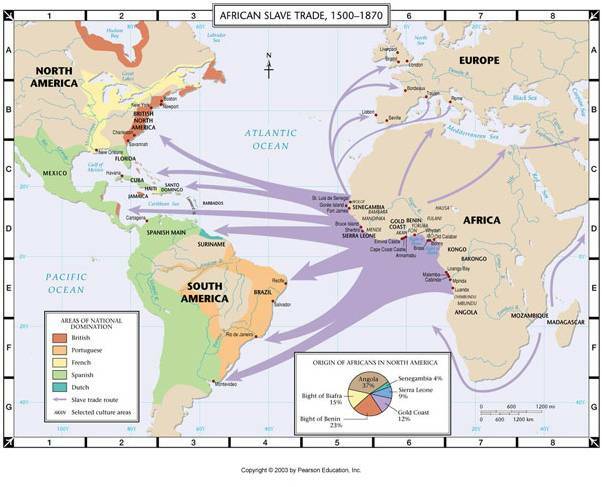 1720, or the discovery of some new plant medicine by way of traditions and culturally-based intellectual property, define the way in which African migration and slavery had its numerous influences upon the United States health care practice. Dancer’s work on the disease ecology of Jamaica includes medical history coverage that is directly related to each of these two major routes for African culture to influence United States medical history and United States medicine. African people added to the population of this country in such a way that their numbers transformed the numbers and density of people in a given region to such a state that new avenues for disease development, disease introduction and disease migration to take place. In turn, it was the impact of slavery upon the traditional lifestyle of the African immigrant that transformed the African body into a receptacle for new sociological and socioeceonomic disease forms to develop. The poverty and poverty-related illnesses absent from the life of a plantation owner once again became common place to the living and work setting. The suffering experienced by the poor associated with local churches and alms houses, which became a symbol of one type of problem that had to be resolved for the benefits of all, was revived by the increasing numbers of slaves forced to reside and work in environments of an extremely unhealthy nature during the years the resided in this country as “servants for the north, slaves to the south”. Danver reviews the impacts of Jamaican history on American through slavery and the yellow fever epidemic. Still, the most important part of his writing pertains to pica, the habit of eating unusual substances for personal, cultural, biological and sociological reasons. During the early 19th century, sociology and human psychology were barely understood. Many new perspectives were out there about the definition and concept of psychology (even some of the earliest books with the term in the title came to be around this town), but the overall social and professional impressions about people, health, disease and the causes for disease, introduced into the philosophy of regular medicine some incredibly ill-conceived concepts about African health and diseases. Unfortunately, this is one of the least taught topics pertaining to African in-migration and slavery. A part of the reason for this exclusion from history lessons is the potential for social discordance developed between teachers and students, authors and their readers, parents and educational administrators. Many of the concepts developed and conclusions drawn from antebellum writings only help to set the stage for the much more controversial postbellum beliefs and attitudes about race, ethnicity, culture and health that developed quite rapidly after the war. The Civil War may have successfully reached its goal regarding the social practice (not belief) about slavery. All of the philosophies favoring slave trade were still a part of everyone’s knowledge base, be they believers and perpetrators or not. Even before the war the anti-slavery movements had its strong followers, pacifists as well as aggressors. But the oppositional groups that formed once these anti-slavery movements won their specific battles came to be even more aggressive, and to many too extremist in their beliefs and attitudes. It is for this reason that the “White Supremacy” movement began its greatest, most aggressive followings in 1868. This movement is a direct consequence of one of the routes taken by a small group of postbellum medical geography writers who were scientists and physicians. The three zones of the earth’s surface defined who we are, what we could become, and what our limitations were regarding work, wealth, place of residency, and ultimate longevity due to inherent disease related traits. 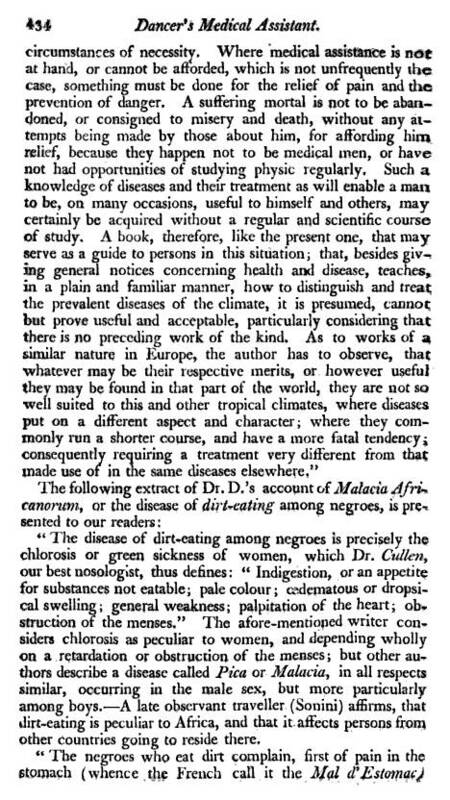 Any positive influences the African experience had upon United States medical knowledge and health around 1800 were hindered by the writings of Chisholm. In his review of the diseases of the African continent Chisolm managed to invent a manner of defining disease patterns that had economic impacts upon African natural resource utilization and harvesting, and in particular the marketing of slaves. According to Chisholm, the diseases of a region such as fevers could be interpreted one of three ways. The traditional method related fevers to their physiological behaviors in the body and its febrile and non-febrile states. Intermittent fevers had periods of fever with period of fever lacking. Continuous fevers were ongoing with no breaks in the body’s temperature. The Ague was a fever which had a period of chills included in the symptomatology. Another way of interpreting febrile diseases pertained to their manner of distribution. There were those of infectious origins that were spread from one person to the next, for which effluvium was the cause and the manner of dissipation to others, and those that erupted due to environmental features alone related to the miasma. There were even a number of scientists at this tyime that tried to hybridize this perspective on fever by attributing some of them to miamsmatic onset, but human effuvium manners of diffusion once the victims reached a particular disease state. The third way to define diseases was by where they occurred. This was especially true for endemic disease patterns, for which their endemic behavior is related primarily if not only to local conditions, such as topography and climate. 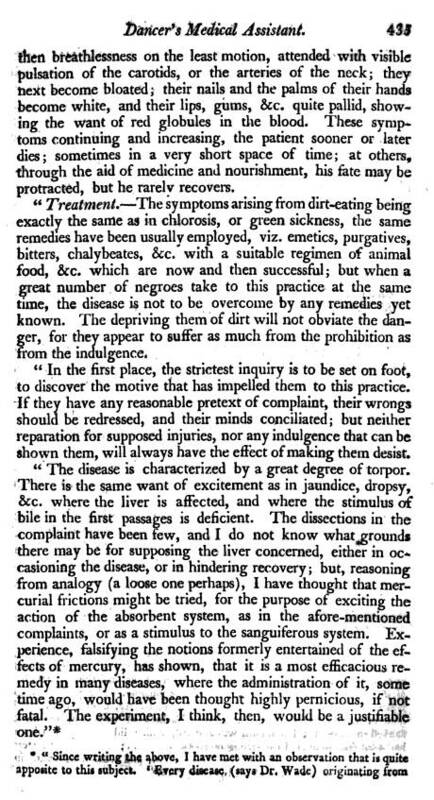 It was this latter fashion of defining unique diseases theat Chisholm used to define the Bulam fever during the 1790s. Bulam fever was a consequence of the island of Bulama located just off the coast of the New Guinea portion of Africa. This island was where an important commune was established to abolish the slave industry. Chisholm claimed the island of Bulama was the origins of yellow fever. Chisholm used his interpretations of this Island Community to compare his perspective on healthy living patterns to the slave trade industry, in effect blaming the missions for the sickness that prevailed within the soon-to-be slaveboat and future slave communities for the Americas. Bulam fever and several other geographically defined fevers would later be related to the much larger epidemic disease yellow yellow fever. 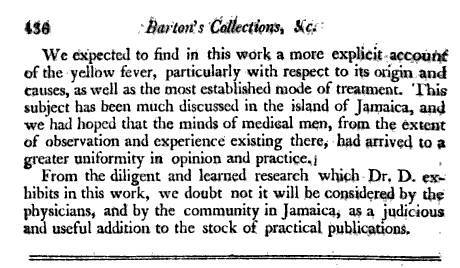 The study of Jamaican health during the late 1790s and early 1800s related directly to the development and modification of a number of special study topics important to medical care in the United States between 1795 and 1825. Aside from yellow fever, the people of Jamaica had a number of health issues to face. According to the standards taught in medical climatology, Jamaica was in the Torrid Zone and so was highly vulnerable to a number of other epidemics besides those related to fevers. The strong influences of the sun made some poeple more susceptible to apoplexy when residing this region. This apoplexy may begin as heat exhaustion or stroke (in a modern sense) but were very likely to evolve into a much worse condition resulting in unconsciousness, loss of speech, and mental anguish (essentially what we consider today to be related to stroke). Bulam Fever is an example of the merging of two beliefs in geographic medicine during the late 1700s and early 1800s. 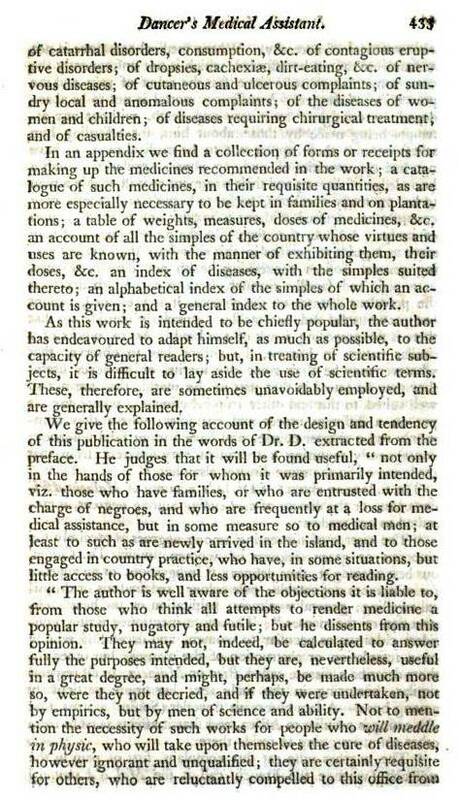 The relationship between the onset of fever and the tropical latitude is an 18th century philosophy, originating perhaps even earlier, but reaching a peak when the essays on epidemics began to be published by 18th century physicians like Hoffman and Riverius. Assigning a place name to a disease also had some regional, cultural connections, but for the most part such names were fairly specific in nature with regards to type of place rather than exact country, such as “Swamp” or “Mountain” Fever. But rarely did these names have a major influence on the politics of the disease, except to be used to determine where the rich versus poor will live, and where the most productivity might be generated by a new region becoming settled. Bulam Fever assigns the name of a specific place to a specific illness with all sorts of cultural values attached to it. Many of these values related to the politics of slavery for the time, and providing future investors with insights into the “healthiness of their stock” so to speak, the value of their investments. This is the political meaning underlying the meaning and reason for any essays out there about Bulam Fever during this period in slave trade history. Likewise, we find this to be the case for other regionally-linked disease patterns with political undertones or meaning. The relationship between poverty and disease was one such relationship drawn between place and disease type. The tendency for specific ethnic groups to only be able to afford to live in basement settings rich in miasma, riverside settings where the stench of putrid waste filled the air, or places adjacent to woolen and paper manufactories, made it more likely for ethnicity and living behaviors to be linked to a disease than any other potential cause that existed. With Asiatic cholera, we see this take place for the Irish and German communities around Cincinnati and the shoreline cities along the Mississippi River in Illinois, and the Mormon community so heavily struck by cholera in Nauvoo in 1849. In 1797, the plague (yellow fever) struck the city of Philadelphia due to the sinful lives of its richest urbanites. In the earliest of missionary settlements, contagion came in an killed off the natives due to God’s wishes and their way of living. Even the syphilis that struck native in Central America, or the Pinto of the highland tribes in Mexico, the impetigo and yaws disgracing certain African communities removed to Middle America, the lice generated dreadlocks hair style found in certain Eastern European settings, and in this case the clay pica behaviors engaged in by Jamaicans (see also the Mexican Disease map in the map section for a related syndrome ca 1880), had these culturally-defined issues to contend with. 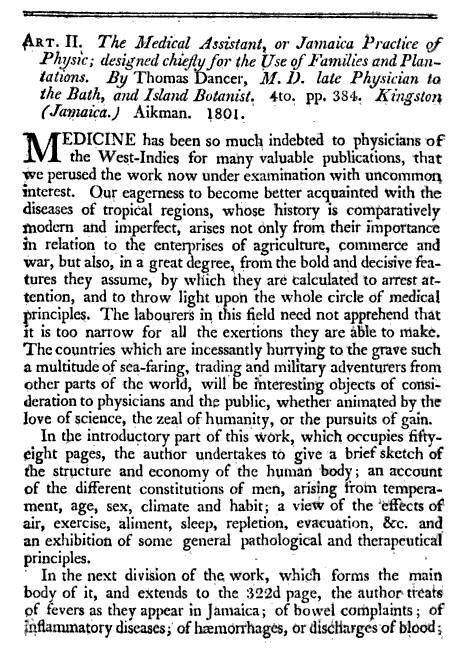 Thomas Dancer’s review of Jamaican medicine and disease is a very good example of how early European-American philosophies play into the medical beliefs for the time. Due to such belief systems, the field of medicine was full of examples of culturally-bound and culturally-defined syndromes and disease states.